Remembering the turbulent times of student activism during the occupation of two major university buildings in Amsterdam, this use of the university grounds as a place of protest is not unfamiliar. Comparatively, a sit-in was held by the students of the Polytechnic University in Athens against the abolishment of student elections and the corrosion of democracy in general in Greece as a result of the military dictatorship junta by Georgios Papadopoulos and Stylianos Patakos in 1973. It seems that universities are still idealized places of democracy and freedom of thinking. Democracy is seen as a right which is demanded through occupying university grounds. These events at the Athens Polytechnic University have influenced the use of the public space in the surrounding neighborhood, Exarcheia, significantly. A frequent visitor of the neighborhood explained the way the public space and major places in the neighbourhood are used for political expression: ‘Exarcheia is a young political advanced area of Athens, until the seventies it was just another neighbourhood of Athens, but after the rebellion of polytechnic school in 1973, things started to change. After the democracy came back anarchists and socialists started to gather around the area and they created their offices and places’. 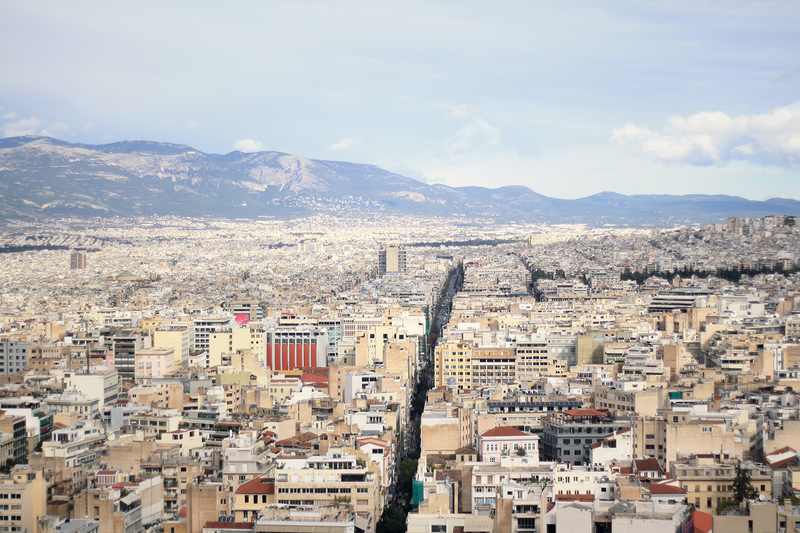 When visiting Athens in the current post-crisis period, Exarcheia appeared to be a striking neighborhood in the cityscape as of the deterioration of public space on the one hand and increased use for street art and graffiti purposes on the other hand. After a young boy was killed in 2008 by a policeman, the neighborhood became heavily militarized by anarchists and extreme leftist groups. An overall anti-police attitude increased and authorities have been absent from the area ever since. 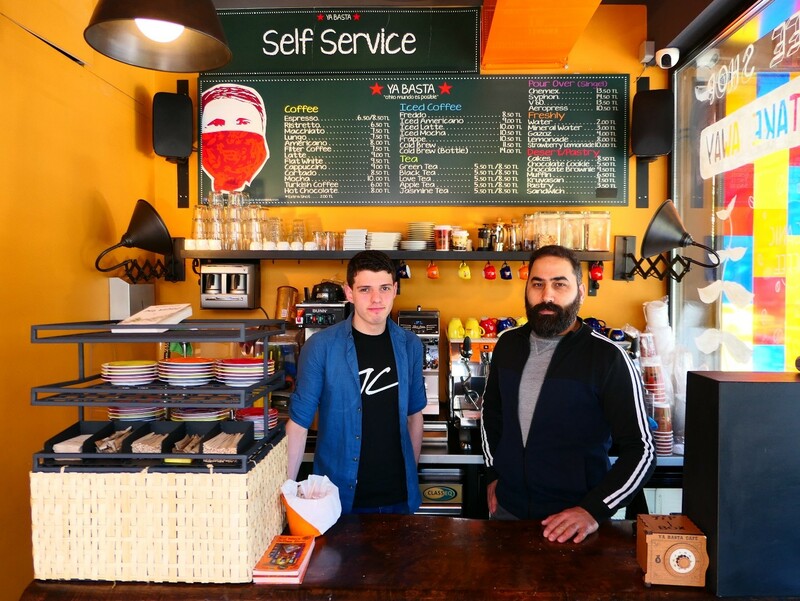 As a result, Exarcheia seems to be a fortress for different ideological groups expressing their messages and beliefs through both peaceful and physical means. The graffiti and street art is used to symbolize their protest. 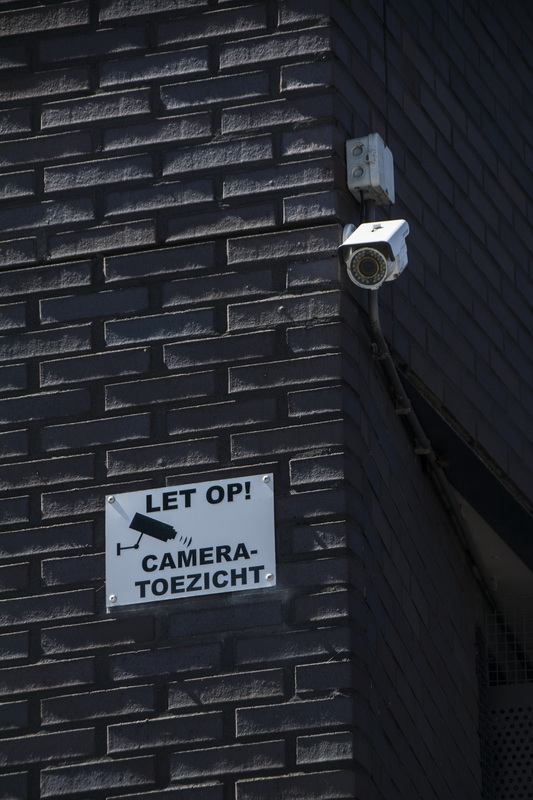 Although anarchist messages and beliefs seem to be most present in the public space, the neighborhood is also used by extreme leftist groups, feminists, football supporters and (other) radical groups. For these ideological groups the street art and graffiti in Exarcheia is full of political meaning. However, when visiting the university grounds, it seemed that a remarkable piece picturing a raven on a red background was not even noticed by the students we spoke. Most people are aware of some kind of political expression of the street art and graffiti in the streets, but are in most cases unable to grasp the underlying meaning of the piece or artists’ purpose. Some people think of the pieces merely as art or decoration and do not seem to be bothered by it. This could partially be explained by the fact that the neighborhood is recognized as hotspot for graffiti and street art as it has even been attracting graffiti artists from outside Athens recently. A resident of Exarcheia felt on the contrary that a lot of inhabitants see these apparent acts of activism as acts of vandalism or ‘hooliganism’ instead. Namely, the increased use of public space by the different ideological groups also means rioting, turmoil and public drug use which disturbs inhabitants in their daily practices. It turns out that those who practice their daily life in public space experience public activism in different ways. This experience of public space being used as canvas for expressing ideological beliefs and messages, has resulted in collective action by inhabitants preventing the public space from deteriorating. For instance, some inhabitants have taken over a former parking lot through bottom-up collective action and turned it into a park. Another example is a public space called Strefi Hill which is increasingly being used by dog-owning inhabitants who use it as a place of refuge. 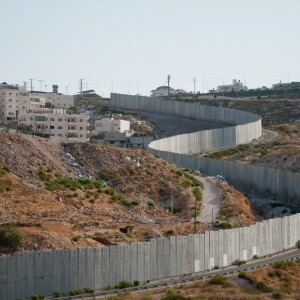 Inhabitants try to solve disturbance through altering the social structure in the neighborhood itself. Moreover, wealthy residents and shop owners living in Exarcheia sometimes even hire experienced artists to create artistic paintings on their properties, in order to prevent it from being tagged by a graffiti sprayer. Apparently, devaluation and degeneration of public space coexists with defensive forms of collective action by inhabitants who create new places. 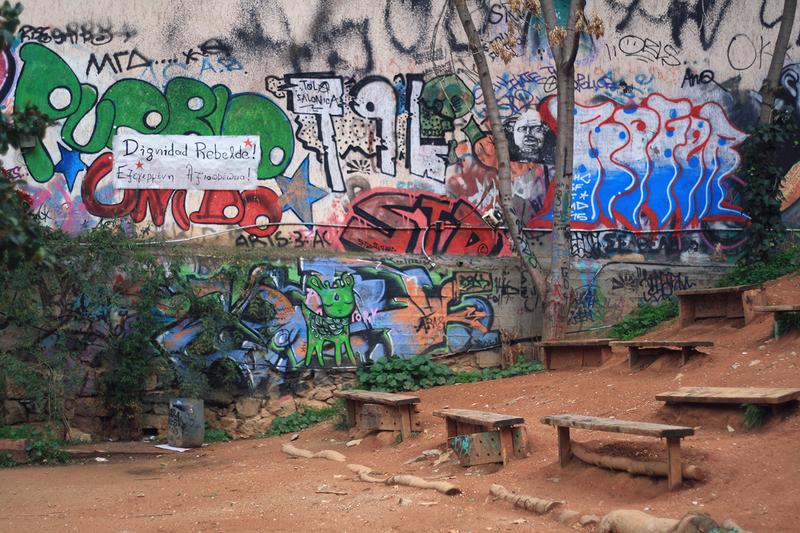 Although Exarcheia is the perfect place for ideological groups to present their viewpoints, neighborhood residents do not seek to have the same lifestyle and viewpoints as the graffiti sprayers and activists display visually. Some of the residents are even annoyed by the deterioration of livability in their personal surroundings and try to reclaim those urban sites. Some look at the graffitis as art or decoration. 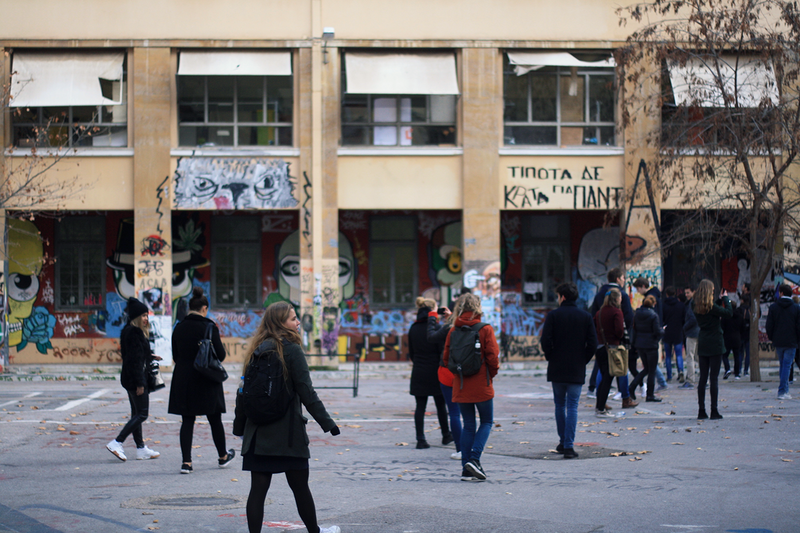 Most importantly, it turns out that the diverse visitors of the neighborhood, all have a different experience in the public spaces of Exarcheia which are full of political expressions. Whereas the Lonely Planet describes the neighborhood as “sketchy at night”, daily life for residents and regular visitors of Exarcheia does go on. Although Exarcheia is used as an important place for expressing political beliefs, which already became visible when university ground were occupied by students and gave the neighborhood a anarchistic reputation, it is also a place where democracy and freedom are enjoyed. Remark by the authors: This post is based on a visit to Athens last January with a group human geography/urban planning bachelor students. A full collection of the posts on Athens can be found here.